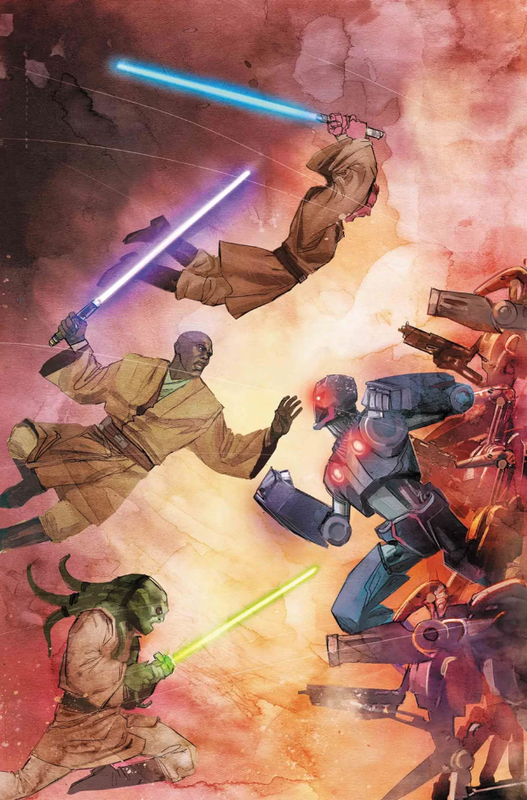 To kick things off on a positive note – I really like the cover for Mace Windu #5. The water color feeling of the image, topped with some explosive action poses where everyone looks emotionally charged, really pops on the page. It gets you pumped. The colors work well with a warm pallete in the center and cooler colors on the edges, it draws the eye in different directions. For the last issue in this mini-series, it’s a great cover to end on. Now into the meat of the matter, and the end to this series. It opens with Kit Fisto fighting a bunch of battle droids and a fun little opening speech. The problem is that it doesn’t make any sense for him to be doing story time in the middle of combat. It’s way too over the top, especially since he eventually gets overwhelmed in the fight and would have seemingly died if Rissa didn’t show up to save him. Throughout this issue, the writing is pretty poor. The dialog between Rissa and Mace is off. It just doesn’t feel natural. Plus Rissa talks to herself, which seems a little odd. Mace squares off against the mercenary droid again, and they both have their own speeches as they fight. Mace beats the droid, which is completely expected. The issue ends with Jedi Prosset Dibs being charged with treason and insubordination in front of the Jedi council. There’s more speeches, Prosset calls the Jedi hypocrites and begs for them to kill him. Instead they sentence him to work in the Jedi library. The whole things ends with Mace and Rissa on a balcony with him telling the worst joke ever, then going on about how the Jedi have to fight. It really is an awful story. One of the biggest problems with this issue and this series is that it tries to poke at the flaws with the Jedi but fails to ever establish any grounds for those accusations. Both the droid mercenary AD-W4 and Jedi Prosset Dibs try to call the Jedi out on hubris and anger and corrupt intentions, but the Jedi they accuse never acknowledge any of the charges. They completely ignore them as if there is absolutely no ground for the things they are being accused of. Because of this, the accusations fall flat and hold no weight. There’s nothing there for the readers to think that these things are true. This in turn robs the story element of having any impact. However, if the story did things differently, and gave some indication that these accusations did hold weight, and might have been true, that could have actually given the story some impact. As is, the whole story is pointless without any meaning. There’s absolutely no reason for anyone to ever read this series. And as if the bad story on its own wasn’t enough, the artwork is very erratic. Some panels actually look pretty good. Some panels look absolutely terrible. Then there’s panels that fall in between the two extremes, and making matters worse, there’s a lack of consistency throughout all the panels. The look of the characters constantly change from one panel to the next. Thus readers not only get a bad story, but bad artwork as well. Now there might be some people out there who might enjoy this story. There might be some people out there who will enjoy the artwork. For me, I thought both were a bust. This is an issue and a mini-series I would not recommend to anyone. I give Mace Windu #5 a half a bikini out of five.